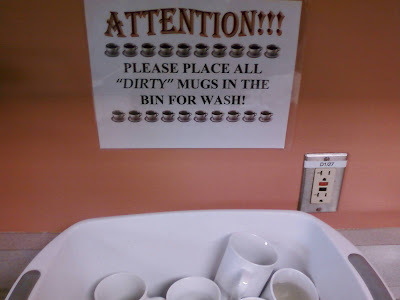 The “Blog” of “Unnecessary” Quotation Marks: "dirty"
Those mugs are totally easy. And they make dirty jokes left and right. Thanks, Ariel. I don't know if you take submissions, but I found this one in front of this terrifying gravel pit full of scrap-metal sculptures. I had an aunt who insisted that her dishes were not dirty. They were used. Perhaps this person is grudgingly using the vernacular commonly understood to indicate used service pieces. Dirty must be a subjective term here... if you just drank water out of it, you might not really see it as being "dirty."